Interested in losing weight, conquering an eating disorder, or eating more nutritiously? You've landed in the right spot! Check out the "Nutrition Counseling" tab, above. Or, are you looking for a nutrition writer? Check out the "Blog" and "Videos" tabs for samples of my writing. If you're just browsing for nutrition information, you might find something apt in those sections as well. Sometimes you luck out with cooking and “easy” means “delicious” (and “nutritious”). That’s the case with the Sweet Potato Gratin in The Pescetarian Plan. 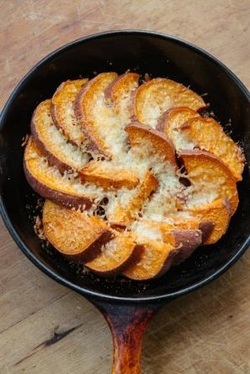 It’s basically just sliced sweet potatoes with a little olive oil, Parmesan and salt and pepper. Done! Now you can turn to the hard part–like the rest of your Thanksgiving meal! Lose weight, lift mood, and get seriously healthy. What's a pescetarian? Someone who eats a basically vegetarian diet, with the addition of seafood. It's the healthiest diet on the planet! My latest book, The Pescetarian Plan, explains how this way of eating can drop weight while adding years to your life. janisjibrin@gmail.com or on The Pescetarian Plan's Facebook page.